Asian markets were mixed on Monday with early gains pared by continuing concerns about the brewing China-US trade war, while the yuan struggled to maintain momentum after the Chinese central bank moved to support the unit. The result provided some much-needed cheer to markets, which brushed off a warning from Beijing that it would impose new tariffs on $60bn worth of US goods if Washington pushes ahead with levies on $200bn of Chinese imports. However, while reports said unofficial talks have been held between Beijing and Washington, trade tensions continue to rise, with a top White House adviser calling China a bad bet and saying its economy - the world's second biggest - was struggling. By the end of trade on Monday Tokyo was 0.1% lower, reversing a morning rally, while Shanghai tumbled 1.3%. Seoul dipped 0.1%. Hong Kong was up 0.3% in late trade but well down from the gains of more than 1% seen soon after the open. Sydney added 0.6%, Singapore gained 0.8% and Taipei was 0.1% higher. Manila and Bangkok were flat while Jakarta jumped more than one percent despite an earthquake that rattled the island of Lombok and killed dozens of people. 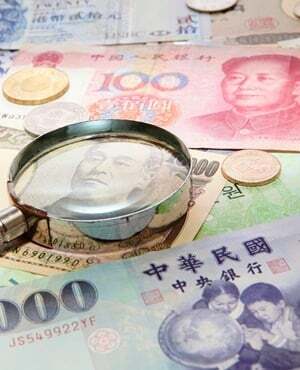 The yuan's early gains petered out, having made small gains Friday after the People's Bank of China unveiled measures making it harder to bet against the currency, which has suffered steep losses in the past two months. The unit, which is wallowing around lows not seen for more than a year, bounced back soon after the announcement. It extended the gains Monday morning before going into reverse. The bank's measure was similar to a move when the currency went into freefall following a devaluation three years ago that rattled global markets. However, analysts were lukewarm on the move. Some said it indicated Chinese leaders were growing increasingly worried about the unit's depreciation. "The yuan kept falling when China did this last time in 2015, so I don't think the PBoC's move will significantly change the market tone," Hao Hong, chief strategist at Bocom International Holdings, told Bloomberg News. "No matter what happened over the weekend, the weakness in Chinese stocks may continue. The trade war is nowhere near its end and China's economy is slowing down, so why would the trend reverse?" In other forex trading, the pound was fighting to recover from Friday's sell-off after Bank of England boss Mark Carney warned that the chance of leaving the EU without a proper deal was "uncomfortably high" and "highly undesirable". The remarks sent sterling tumbling, with an interest rate rise last week unable to provide any support. In early European trade London was flat, Paris added 0.1% and Frankfurt gained 0.2%.